For dressing: In jar with screw-top lid, combine the 1/4 cup oil, lemon peel and juice, the 1/2 teaspoon salt and the 1/4 teaspoon black pepper. Cover and shake well; set aside. 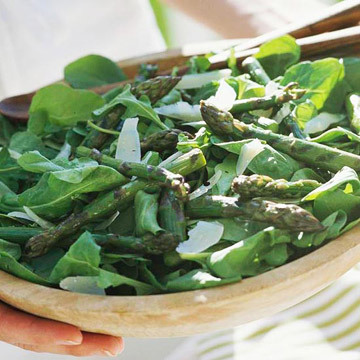 Clean and trim asparagus; coat lightly with the 2 tablespoons oil. Sprinkle with salt and pepper. Set aside. Meanwhile, clean arugula or spinach and remove excess stems; dry. Set aside. While asparagus is warm, toss with arugula and dressing (this will wilt the arugula). Divide among 4 dinner plates and top with Parmesan curls. Serve immediately. Makes 4 servings.